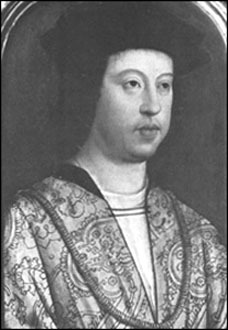 Ferdinand V of Castile and Leon, also called Ferdinand II of Aragon, was the son of John I of Aragon by his second marriage with Joanna Henriquez, of the family of the hereditary grand admirals of Castile, and was born at Sos in Aragon on the 10th or 16th of March 1452. Under the name of "the Catholic" and as the husband of Isabella, Queen of Castile, he played a great part in Europe. His share in establishing the royal authority in all parts of Spain, in expelling the Moors from Granada, in the conquest of Navarre, in forwarding the voyages of Christopher Columbus, and in contending with France for the supremacy in Italy, is of primary importance in Spanish history. In personal character he had none of the attractive qualities of his wife. It may fairly be said of him that he was purely a politician. His marriage in 1469 to his cousin Isabella of Castile was dictated by the desire to unite his own claims to the crown, as the head of the younger branch of the same family, with hers, in case Henry IV should die childless. When the king died in 1474 he made an ungenerous attempt to procure his own proclamation as king without recognition of the rights of his wife. Isabella asserted her claims firmly, and at all times insisted on a voice in the government of Castile. But though Ferdinand had sought a selfish political advantage at his wife's expense, he was well aware of her ability and high character. Their married life was dignified and harmonious; for Ferdinand had no common vices, and their views in government were identical. The king cared for nothing but dominion and political power. His character explains the most ungracious acts of his life, such as his breach of his promises to Columbus, his distrust of Ximenez and of the Great Captain. He had given wide privileges to Columbus on the supposition that the discoverer would reach powerful kingdoms. When islands inhabited by feeble savages were discovered, Ferdinand appreciated the risk that they might become the seat of a power too strong to be controlled, and took measures to avert the danger. He feared that Ximinez and the Great Captain would become too independent, and watched them in the interest of the royal authority. Whether he ever boasted, as he is said to have boasted, that he had deceived Louis XII of France twelve times, is very doubtful; but it is certain that when Ferdinand made a treaty, or came to an understanding with any one, the contract was generally found to contain implied meanings favorable to himself which the other contracting party had not expected. The worst of his character was prominently shown after the death of Isabella in 1504. He endeavored to lay hands on the regency of Castile in the name of his insane daughter Joanna, and without regard to the claims of her husband Philip of Habsburg. The hostility of the Castilian nobles, by whom he was disliked, baffled him for a time, but on Philip's early death he reasserted his authority. His second marriage with Germaine of Foix in 1505 was apparently contracted in the hope that by securing an heir male he might punish his Habsburg son-in-law. Aragon did not recognize the right of women to reign, and would have been detached together with Catalonia, Valencia and the Italian states if he had had a son. This was the only occasion on which Ferdinand allowed passion to obscure his political sense, and lead him into acts which tended to undo his work of national unification. As King of Aragon he abstained from inroads on the liberties of his subjects which might have provoked rebellion. A few acts of illegal violence are recorded of him -- as when he invited a notorious demagogue of Saragossa to visit him in the palace, and caused the man to be executed without form of trial. Once when presiding over the Aragonese cortes he found himself sitting in a thorough draught and ordered the window to be shut, adding in a lower voice, "If it is not against the fueros." But his ill-will did not go beyond such sneers. He was too intent on building up a great state to complicate his difficulties by internal troubles. His arrangement of the convention of Guadalupe, which ended the fierce Agrarian conflicts of Catalonia, was wise and profitable to the country, though it was probably dictated mainly by a wish to weaken the landowners by taking away their feudal rights. Ferdinand died at Madrigalejo in Estremadura on the 23rd of January 1516.